Editor’s Note: We are pleased to reprint this selection from the Mineralogical Record, May–June 2002, pp. 255–260. Click on the above link for subscription information to America’s finest mineral magazine. We would like to thank Wendell Wilson of the Mineralogical Record and Jeff Scovil of Scovil Photography for permission to reprint this article. In our business, Munich means one thing – minerals. And for the 2001 edition of the show, I arrive with American dealers Victor Yount and Carter Rich, fellow passengers during a slate-gray morning full of promise and excitement. It is the 38th Munich show and while it does not officially open until Friday, set-ups start today. The bus takes us to the city center and a taxi brings me to the charming Seibel hotel to drop my luggage and clean up. Across the avenue disassembled tents litter the central park like punctured dirigibles; testament that Octoberfest has just concluded. Looking up the avenue reveals the old Fairplex being torn down to make way for new high rises. I miss the charm and location of the original show site. The new site, the Munich Trade Fair Centre, is built on the old Munich airport. It is an enormous complex of glass and steel, modern and convenient, but lacks warmth. An underground line whisks those of us who stay in downtown Munich easily to the show. Figure 1. 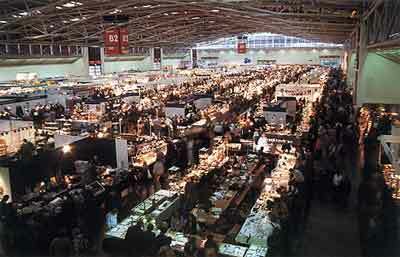 The Munich Show, Hall B2, at the Munich Trade Fair Center. Jeff Scovil photo. Munich Mineralientage is BIG: three halls of 25,000 m2, 740 dealers from 42 countries, 2.5 km of carpet, 3000 beer tables and special exhibit areas! I arrive at 10 am on Tuesday Oct. 23 to spend the rest of the day searching out what is new and exciting. Many people are setting up; noise and confusion reign. I will start in Hall B3, which is filled with dealers from producing countries like Morocco, China, Russia and Peru. These are mostly table setups without fancy booths, many selling wholesale by lot only. Before me I see tray after tray of vanadinites. The color has improved, less brown since I described these Moroccan treasures in my St Marie report. These dealers have wrapped the pieces carefully to avoid damage. 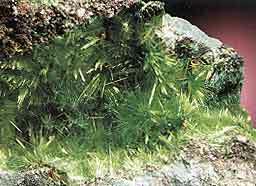 Most are miniature or cabinet specimens with bright but small 1 cm crystals. Some fine pieces are included and these sell rapidly, as there are already a dozen American dealers I recognize. Other Moroccan items of interest are eyrthrite miniatures with crystals up to 1 cm (DM200–500), some skutterudite up to 2 cm, roselite crystal groups to 0.7 cm, small, fine azurite roses (DM100–400), a few of the new golden apatites (DM200–400), and a scattering of cerrusites and anglesites. The best anglesites are bright yellow and undamaged, a miniature is offered with a 4 cm main crystal at DM1500. 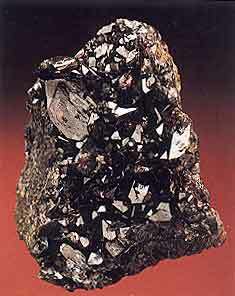 Scorodite crystals up to 2 cm and sharp on matrix were rare but available with searching from Agbhar, Morocco (see photo). Figure 2. Scorodite crystal pocket in matrix, 4.5 cm, from the Aghbar mine, Bou Azzer, Morocco. Ernesto Ossola specimen; Jeff Scovil photo. The vanadinites are priced all over the place from a few DM per piece to some costing many thousands. If one is willing to negotiate and buy a whole flat, a tremendous discount can be achieved. Several dealers, both familiar and new, represent China. Lots of stibnite, fluorite, calcite, scheelite, and wolframite were available from the usual sources in all sizes and price ranges. As usual, poor local packing in China hurts quality. Amazingly some pieces arrived in perfect condition. One of the Chinese dealers shows me a mirror-bright orange 2 cm tetrahedron attached near the base of a long, white, slender quartz crystal growing out of a group of similar quartzes. Luckily I pass his test; correctly identifying it as a helvite crystal. It is excellent, although awkward in aesthetics, and difficult to improve by trimming, in my opinion, especially for, in my opinion, especially for the DM2500 being asked, so I move on. Marty Zinn finds another perfectly formed helvite on a smaller quartz cluster, the best I saw at the show, and takes home a great prize. The other mineral of interest from China is fine inesite, showing great promise. Large pink clusters of small crystals up to 14 cm across made attractive specimens, and here the price was down from those I saw in St Marie. Some fine pieces changed hands at DM1500. Figure 3. Fluorapophyllite cluster on stilbite, 7.8 cm, from Momin Akhada, Maharashtra, India. John S. White specimen; Jeff Scovil photo. The most interesting new mineral of the show is first seen here in Hall B3, with Mr. Makki, an Indian dealer on his first visit to Munich. He has a new find of green apophyllite balls with an overgrowth of colorless apophyllite, making for spectacular and beautiful specimens. I am reminded of those dome-mirrors in the discos of the 1970s! Alas, I arrive too late and see only reserved pieces and must start the hunt for what has already been sold, many of which will be resold in other booths. He has only one large plate left unsold, a three-foot stilbite matrix with perhaps twenty-five 5–6 cm apophyllite balls on it. He asks US$20,000! After I decline, it is sold within a few hours to an American collector! Fortunately I find one of the dealers who helped unpack this lot. He sells me all 27 pieces for a fair price. And the venerable K.C. Pandy shows up a little later and has some of the same. He explains these are from a new area, unknown for fine minerals before. These are the result of digging a well, which unearthed this unique pocket. He believes there will be only a few hundred pieces total, so I chased down what I could. John White was lucky to get a great one (pictured). Figure 4. 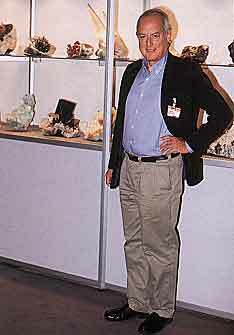 Adelberto Giazotto standing beside one of the special exhibition cases featuring his superb collection. Jeff Scovil photo. Most of the Russians have older stocks of the usual suspects, some nice new pieces from Dalnagorsk, but the majority of their items are fossils, gemstones, jewelry and objects d’art. Fine minerals are now quite rare from Russia. One fine sperrylite was available for the advanced collector, a cluster with crystals to 1.3 cm (see photo). The several Peruvian dealers have fine wire silvers. Some are quite large, to 18 cm, but many of these larger wires were already offered at the Denver show. I saw a few small, but nice rhodochrosites, as well as Japan twin quartzes, but most of these were pre-sold before the show to regular customer-dealers. The minerals in Hall B3 are almost all new specimens, at least new to a mineral show. In Tucson or Denver, American collectors are used to seeing the same minerals recycled or left unsold at many shows. I myself have suffered the embarrassment of having a fine mineral go unsold for several shows and having a friendly competitor sing “Happy Birthday” to the specimen! All these lots here will mostly disappear, being sold or traded before 5:00 pm Sunday. Working my way into Hall B2, I see many European dealers I am familiar with. There are excellent booths going up and, of course, boxes and boxes of specimens. This hall is similar to the TGMS Show (the mineral side), with many individual unique specimens, both contemporary and classic. Many are recognizable from previous shows on both sides of the Atlantic. To bring Tucson into perspective, there is even a re-creation near the middle of this hall, of the “Old Desert Inn Bar” with lots of seats for meetings or drinks! Next to this area is the so-called “overseas section,” which includes many American dealers. Also here are Colombian, Brazilian, Namibian and Pakistani dealers; a great sign for international cooperation. Even with it being just six weeks after the tragedy of Sept 11, four out of the six scheduled Pakistani dealers made it to the show. Figure 5. 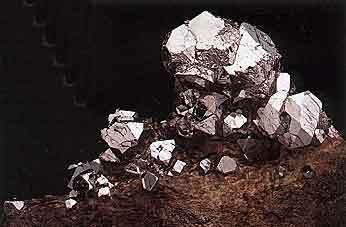 Sperrylite crystals to 1.3 cm, from the October mine, Talnakh, Krasnoyarsk, Russia. KARP specimen; Jeff Scovil photo. In a middle row in Hall B2, about fifty shadow cases are being set up for special displays of unique collections. These private and museum displays are one of the many highlights for any visitor, especially those from overseas. Here, because of the larger, more complex booths and the fact that these very dealers are out shopping in Hall B3, set-up is slower, so not many minerals are available this day. Also these first days are dedicated to becoming organized (if possible), so many dealers are not happy to show their minerals until they are ready to open, which all of us can understand. I leave this area and enter Hall B1, which has an emphasis on jewelry, beads, cut stones and art objects. Figure 6. Shattuckite in spherical sprays to 9 mm, from Mesopotamia, Namibia. Namibia Minerals specimen. Jeff Scovil photo. There are many minerals, too, so the mineral collector must check here also. These are mostly larger, more elegant, three-walled booths, thus much is still only partially built. The special exhibits are in a special section of B1. This year the theme is “Cave Secrets.” Many wonderful features resonate around this theme. For the mineral enthusiast this area features some sixty pieces from Martin Zinn’s extraordinary stalactite-stalagmite collection. He has a potpourri of types, including a 25 cm malachite and a 12 cm pyromorphite that would grace the finest collection. Any museum curator worth his/her salt should be sweet-talking “The Marty” to try to get this collection on permanent exhibition. What a great crowd pleaser! Inside a smaller showcase at the entry to this area is one of this year’s finest Munich mineral specimens. It is a 30 cm high complex cluster malachite stalactite; owned by the fine French dealers, Gobin. This specimen was reserved; but shown to me before it was on public display; compliments of the new owner. Also featured is a marvelous representation of Adalberto Giazotto’s Mineral Museum in Pisa, Italy. He collects large specimens. For this show, a total of 41 boxes were created, holding up to four pieces each, weighing in at 4000 lbs! 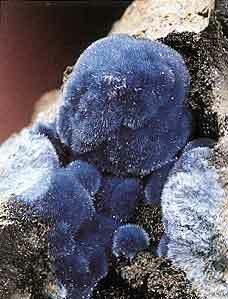 I remember my first visit to his collection, seeing aquamarines three feet across and still gemmy! An amazing tour de force! In a specially created theater will be a fifteen-minute 3D show featuring the peaceful underground world. Of special interest, exhibits of all the major museums of Munich, the Museum of Bochum, Freiberg, Regensberg, Graz, and Vienna, Austria and Alistrati, Greece, surround the “Forum Minerale”! Figure 7. Cuprosklodowskite with malachite, 3.5 cm across, from the Musonoi mine, Congo. Miner’s Lunchbox specimen; Jeff Scovil photo. This is enough for one day, home by underground, and to a small favorite haunt of mineral dealers. At dinner, I learn from Helmut Bruckner that he has received the rest of the famous Swethelm Collection. So over a meal of Sweinsox, I make an appointment to see him the next morning. Early the next day I arrive to a busy sight. Most of the 740 dealers are now in the process of set-up. Chaos is the rule. It is Wednesday and hard to know where to start. I will look in Hall B2 because quality pieces are mostly found here. I am reminded that for this report I cannot cover even a small portion of the vast number of mineral dealers individually. Hopefully we can point to several fine new finds, and leave you wanting to visit yourself. Here are a few specific highlights, mostly from Jeff Scovil’s superb photo selections. I keep my appointment with Helmut and obtain among other things, a classic Austrian dolomite. The collection contains many American, Canadian, and Mexican specimens from twenty years ago. Across the hall, Namibia Minerals has a new find of shattuckite from Mesopotamia, Namibia, some crystals reaching .9 cm. The Miner’s Lunch Box has picked up a collection of new cuprosklodowskite from the Democratic Republic of the Congo. The largest needle-like crystals are 3.5 cm and bright color. Down the aisle I am struck by a blue glow. Crystal Classics’ booth is filled in the back with azurite aggregates (see photo). In addition, Ian has a 2.6 cm diamond octahedron from the Congo that would please anyone. From Sierra Gordo, Chile, he has new blue penfieldite. François Leitard has several new items including twin calcites up to 3.5 cm from Rio Grande do Sul. 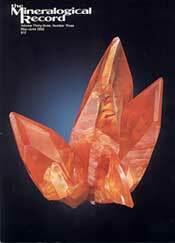 In high demand from him were translucent blue afghanite crystals in calcite, some 4 cm, from Sar-e-Sang, Afghanistan. He also had a few fine sodalite crystals up to 2 cm from the same area. Figure 8. 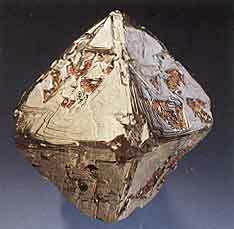 Octahedral diamond crystal, 2.6 cm, from Mbuji-Mayi, Congo. Crystal Classics specimen; Jeff Scovil photo. Back to Africa and we find several dealers, including Erich Schmidt and Chris Johnston, featuring some of the finest schorl crystals ever produced. Singles ranged up to 20 cm and clusters to 50 cm, some mirror bright and undamaged. These are from the Erongo Mountains. A few new aquamarines are still available from this locality as well as some fine single blue jeremejevites up to 4 cm. Namibia also produced some interesting scepter quartzes from the Orange River. Madagascar is well on its way to being a mineral specimen supplier once again. Several dealers are here, including Enterprise TDS, and Tropic Stone. An unusual amethyst quartz scepter from a new find in the Toamasina area was unique (see photo). Many fine Jap-twin quartz, corundum, beryl, tourmaline, and feldspar crystals are featured in both booths. 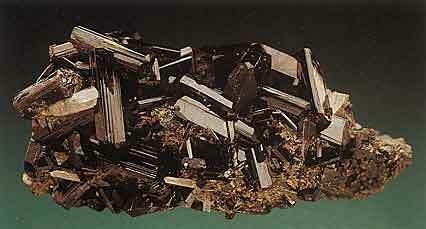 Rare minerals, including the new londonite, are also seen. There is great hope for more production. Another African country about to surprise is Mozambique. I visited in 1971 and know the potential. Figure 9. 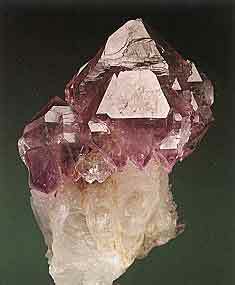 Amethyst scepter, 7.4 cm, from Ambatondrazaka, Toamasina, Madagascar. Tropic Stone specimen; Jeff Scovil photo. Mozambique Minerals had etched morganites to 12 cm and some large, poorly formed but gemmy greenish herderites to 10 cm. They also had a few of the famous large nodules of lepidolite from Alto Ligonha, along with various colored tourmalines from this famous district. Two perfect 3 cm columbites from Naipa, each priced at DM700, and a 15 cm topaz from Naipa were also on display. Great hope for the future. Various other new minerals got our attention. Ennio Prato has a fine pargasite from Mogok, Burma. It is 3.8 cm and an excellent green, much better than any I have obtained or even seen (see photo), and I have been to Burma in conjunction with my gemstone business some 20 times. How often does that happen? Often! 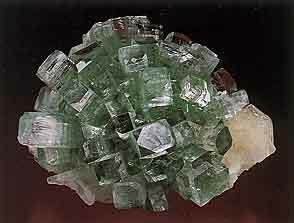 From Brazil, Marcus Budil had some new green Pederneira Mine tourmalines, many of which, while not large at 8 to 10 cm, were gem and unrepaired. Most of those produced have been heavily repaired according to his Brazilian partner. Colombian Emeralds Corp. had a nice selection of Muzo emerald specimens. The finest to my eye was a 3 x 4 cm cluster of emeralds asking DM3000. They are direct from Colombia (they attend Tucson) and while they sell mostly cut emeralds, it is nice to see some being preserved from the cutting wheel. Figure 10. 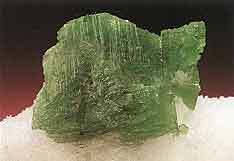 Pargasite crystal, 3.8 cm, from Mogok, Burma. Ennio Prato specimen; Jeff Scovil photo. Figure 11. Epidote crystal group, 5.6 cm, from the Zagros Mountains, Iran. Marx-Mueller specimen; Jeff Scovil photo.